Currently, we are able to ship within California, Colorado, New York, North Carolina, Florida, Washington D. C., & Wyoming. Bentrock is naturally a more powerful and rich wine yet is not heavy. Adjectives are dangerous things but if we see Francesca as linear and elegant we can say that Bentrock is explosive, fuller in the mouth but finishes in the same place. Bentrock has a stone fruit personality dominated by ripe peaches and apricots along with a wonderful backbone of acidity that supports and transports these flavors in the mouth. It too is delicious today but should show its full potential in four to six years and perhaps even longer (2021-2024). Francesca has what we call a “cool” profile that is dominated by a flinty nose followed by white flowers. Its attack is subtle but builds, fills the mouth and is linear in nature. The wine’s natural salinity awakens your taste buds and one can imagine this with hard cheeses or with a main dish such as seared scallops. The wine is delicious today, but we expect it will show its full potential in three to five years (2021-2023). Bentrock Vineyard is located at the southwestern edge of the Sta. Rita Hills appellation. Its north-facing, rolling hills are routinely exposed to cold ocean breezes. The vineyard ranges from about 400 to 500 feet in elevation and is fairly steep. These elements provide for slow ripening and low yields, ideal for Burgundian style wines. The approximate 92-acre vineyard, (just under 80 Pinot Noir and slightly more than 13 chardonnay) were planted in 2007. The soils are primarily clay, sediment and shale soils with outcrops of diatomaceous earth. Francesca Vineyard is the most westerly vineyard in the Santa Rita Hills appellation and is perched on a windswept knoll. The soils in this cold and windy location are comprised of shaly loams of sedimentary origin. 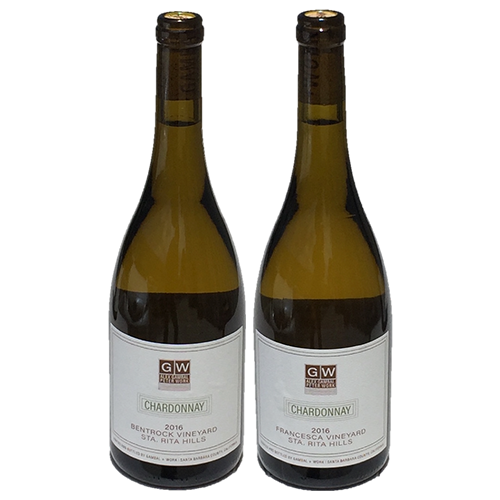 The 7-acre vineyard is comprised of one-half acre of Chardonnay Wente clone and the balance in three clones of Pinot Noir; Pommard, 115, and 667. Due to the wind and cool and saline soils, the more vigorous rootstock 1103P makes a perfect partner for the Pinot Noir and Chardonnay scions creating a perfectly balanced vine. Yields are low at no more than 2 tons per acres and the fruit is complex.